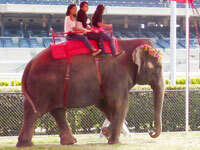 When event organizers provide animals for rides and displays it is not, as it may appear, harmless fun. ADI findings have shown that, despite reassurances that the animals have been well cared for, abuse usually occurs behind the scenes, while the animals are being trained or as part of their daily regime, during which most will be deprived of all the normal, social and mental stimulation they would enjoy in the wild. In the US, has launched a campaign called No Fun For Elephants which has secured a “no elephant rides” policy at a growing number of events. Please help us expose the suffering of animals used for events and rides and campaign for an end to their needless use. Minor League baseball teams host cruel ‘Cowboy Monkey Rodeo’. Wild animals are not prom props! Join ADI in urging country fair to axe ‘Victorian’ lion act! St Edmundsbury Borough Council held a Living Nativity featuring donkeys, alpacas and sheep at its Christmas Fayre in December 2013. The council has stated that it was “satisfied with the welfare standards of the animals". ADI has also called on director Kevin Spacey to replace the rhesus macaque used in performances of Inherit The Wind at The Old Vic and UK councils to refuse permission for shows such as Apassionata, Ben Hur Live and art installations using live animals.